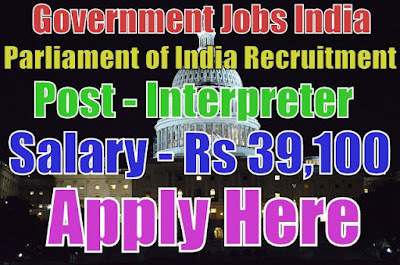 Parliament of India has published recruitment 2017 notification for 08 parliamentary interpreter grade-2 posts. All legible and interested candidates can apply on or before (15-03-2017). Further more information about salary details, application fee, educational qualifications and more details / information about these posts is mentioned in detailed below. 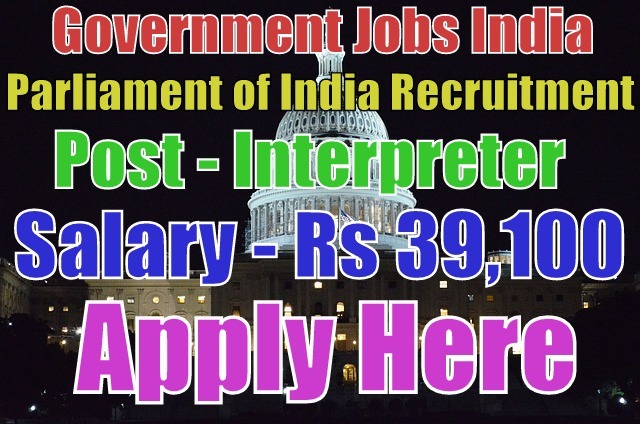 Salary and Grade Pay - For parliamentary interpreter grade-2, salary will be Rs 15,600 - 39,100 with Rs 5,400 grade pay (A level 10 post in the pay matrix(provisional)). Further more information about salary details is mentioned in advertisement. Educational Qualifications - For the post of parliamentary interpreter, candidate should must have done 10th, 12th, graduation degree, master's degree in english / hindi with experience in translation / interpretation work or it's equivalent / relevant / higher qualification from a recognized board or university. To know more see advertisement. Selection Method - For parliament vacancies, candidate will be selected on the basis of their performance in oration test, written test, simultaneous interpretation test and then personal interview. Candidates should must be prepared for these tests. After downloading and filling the application form candidates have to send application form along with needed / relevant testimonials(which is mentioned in detailed advertisement) to the given desired address. The Joint Recruitment Cell, Room no. 521, Parliament House Annex, New Delhi - 110001. Last Date - All candidates should must apply on or before (15-03-2017). Application Fee - No fee.